Rambo Amadeus (Antonije Pušić), another prominent artist who emerged on the Yugoslav rock scene while it still existed (and another inventor of his own unique category, panache and sui generis style – just like Dušan Kojić) once said that his first encounter with Disciplina Kičme’s debut album in 1983 felt like “someone robbed me naked”. As a creative act of bravery, the album was truly nothing like anything ever released in the region. Its unique, uncompromising conceptual approach instantly redefined what an underground standard ought to be, setting the bar high in a new way that very few managed to approach ever since. 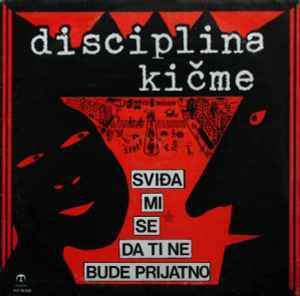 Following the breakup of Šarlo Akrobata in October 1981, Dušan Kojić created Disciplina Kičme in November 1981 (together with Šarlo’s former manager Nenad Krasovac Kele) with the intent to push things even further down the path of experimentalization. The result was a minimalistic band consisting of only two members – a drummer and a bass player – performing material in an inimitable way (including some very creative bass guitar approaches). An old saying goes that art thrives on limitations, and “Sviđa Mi Se Da Ti Ne Bude Prijatno” is an excellent living aural proof of that. But unique does not equate commercial. Unusual band configuration and its eccentric sound scared the record executives, resulting in a long uphill battle to get the record released. In was not until December 1982 – more than a year after being formed, and nine months after its live debut – that the band finally had a chance to enter a recording studio. Despite being recorded in mere seven days, the album's release materialized only well into 1983, essentially a year after it might have been on the store shelves. Even then, the entire press run ended up being only 5001 copies, making the original vinyl edition an instant collector’s item. Despite all of these real world predicaments, “Sviđa Mi Se Da Ti Ne Bude Prijatno” shines as a timeless act of resistance, a small victory against the time and place. It is an example of a record that anyone who appreciates innovation should own.